Our cell phone backup service backs up texts, contacts, photos, movies, and music for your peace of mind. If you lose your phone or if you get a new mobile phone sooner or later, you will need our phone backup service.. We offer sms backup service, text backup service, mobile backup service and cell phone backup service. We can save text messages, save photos, save videos, save ringtones, save music, save contacts or any other data that you may have on your phone. We can back up to a CD and mail it to you, or we can back up to a time-sensitive download link. We process each job the SAME day we receive your your phone. We Immediately rush your package back to you the same day! Phone Backup Service for ANYONE. Of course there is software and methods where you can backup your phone by yourself! But if you are wary of technology and would like someone to do this for you, then our service is exactly for YOU! Our Phone Backup Service is a PER-USE, ONE-TIME Service. No-Subscription! Just use our service each time you need it. Just send us your phone and we will rush the backup and mail your phone back to you! In some cases it is true that we only need the SIM card or the SD card. But usually the data we need is stored on the phone’s internal memory and not on the card, so this is why even if you have the type of phone that has a SIM card, it is still more reliable for us if we have your whole phone! Basic charge for our backup service is ONE-TIME $45 . See below for other options. Use Our Cell Phone Backup Service to Backup Your Priceless Phone Data! Why would you need our cell phone backup service? 1) You are worried that if you ever lose your phone all your priceless texts, photos, videos, etc. will be lost forever. 2) You may be buying a new phone and you want to transfer all your important data from your old phone to your new phone. 3) You may not feel comfortable transferring the data yourself and you would like a professional to do it for you because you are worried that you might do something wrong. 4) You have the need for a one-time transfer and you don’t want to sign up for one of those subscription services. Don’t be Without a Phone While We Perform our Service! We suggest that before you order our service, you first get a temporary replacement phone. Once you have your temporary phone, you can ask your provider to have your cell phone number temporarily CALL-FORWARDED to your temporary replacement phone. This way you will still be able to receive phone calls while you send your regular phone to us! THEN.... order our service below. Acer, Alcatel, Apple, Audiovox, BenQ-Siemens, CSL, Cyon, Danger, DBTel, Dell, Ericsson, G'Five, GeoSentric, Goldvish, Gradiente, Henry Park, Hewlett-Packard, HTC Corporation, Huawei, INQ, Inventec, KTF Ever, Kejian, Kyocera, Lenovo, LG, Lyubmarin, M.Mobile, MagCom, Micromax Mobile, Nexian, Ningbo Bird, Nokia, Onida Electronics, Palm, Panasonic, Pantech Curitel, Pantech Wireless, Peiker Acustic, Research In Motion, SAGEM, Samsung, Sanyo, Sendo, Sharp Corporation, Sony Ericsson, Spectronic, VK Mobile, Vertu, Videocon. Alianet, Alltel, Ameritech, Arch, AT&T, Bell Canada, Blue Sky Frog, Boost, Carolina West, Cellcom, Cellular One, Cellular South, Centennial Wireless, Cincinnati Bell, Cingular, Cingular Blue, Claro, Comviq, CREDO, Cricket, CTI Movil, Digicell, Edge, Einstein PCS, Fido, GCI, Immix, Koodo, Metro PCS, Mobile One, Movistar, Net10, Nextel, Ntelos, Optus, Orange, Page Plus, PC Mobile, Pocket Wireless, PowerTel, Qwest, Sasktel, Smart Telecom, Solo, Southern Linc, Speak Out, Sprint, Straight Talk, SunCom, Sure West, SwissCom, T Mobile, TBayTel, TelCel, Telenor, Telus, Tim, Unicel, US Cellular, Mobile, Verizon, Viaero, Vodafone, WellCom. How our Mobile Phone Backup Service Works. 1) (OPTIONAL) Get a temporary phone and call-forward your existing cell phone number to it, so you won’t miss your main cell phone too much. See above. 3) Receive an immediate email confirmation with instructions on how to mail in your phone. 4) WAIT about 10 days for us to receive your package, do the job and to mail your phone and/or CD back to you or post your download link to retrieve your data. NOTE: WE DO THE JOB THE SAME DAY RECEIVED! THE BIGGEST DELAY IS THE MAILING TO AND FROM OUR LOCATION. In order to make the backup you request, we might need to view or listen to your data but we will not judge or comment on the nature of your data, Nor will be EVER share your data with anyone. You can be assured of COMPLETE PRIVACY. IMPORTANT: WE ARE NOT A PHONE REPAIR SERVICE. WE CANNOT DO THE JOB IF YOUR PHONE IS NOT FUNCTIONAL. MAKE SURE THE BATTERY IS CHARGED AND THE PHONE IS WORKING, THAT THE CHARGING PORT IS WORKING AND THAT YOU INCLUDE THE CHARGING CABLE. MAKE SURE THE SCREEN IS WORKING. IF YOUR PHONE IS NOT WORKING THEN PLEASE TAKE IT TO A LOCAL REPAIR PLACE FIRST AND GET IT WORKING AND THEN SEND IT TO US. WE WILL ALSO NEED YOUR PHONE PASSWORD. NOTE: Immediately AFTER your make your purchase below, you will receive an email that provides instructions on how to mail in your phone. Please look in your spam or junk mail folder. If you don’t see it you can download it here. NOTE: This service is available only to USA customers at this time. This backup will include texts, contacts, voicemails, photos, movies, ringtones, music and anything else that you have on your phone. Your data will be posted on a time-sensitive url where you can instantly download it (and your phone will be returned). You will be notified by email when it is ready. This backup will include texts, contacts, voicemails, photos, movies, ringtones, music and anything else that you have on your phone. Your data will be saved to a CD and mailed to you, along with your phone. You will be notified by email when the job is done and in the mail. This is a special service where in ADDITION to backing up everything on your phone to a CD we will ALSO load all the data onto your new phone! (You need to send us your old and your new phone.) This service will include texts, contacts, voicemails photos, movies, ringtones, music and anything else that you have on your phone. 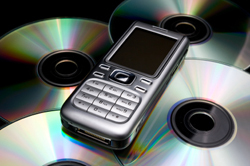 Your data will be saved to a CD and mailed to you , along with both your phones. You will be notified by email when the job is done and in the mail.